At a time when funding for global health appears to be shrinking—and other parts of our national budget look to be getting larger and larger—I have to stop and reflect on how the limited resources for global health might be spent to have the biggest possible impact. No doubt that many people working in global health are going through the same soul-searching process as each of us thinks about how the limited resources can be used not only to improve health, but also to contribute to the wellbeing and development of the world’s poor. Working in the field of family planning, I became an “accidental activist”—becoming more and more convinced that investments in family planning are critical to helping individuals and countries achieve their potential. Family planning has been referred to as a “best buy” for many years, and when I started looking at the evidence, I found incredible results. Until I started seeing this type of evidence, I thought of investments in health as the right thing to do—so that people can live productive, satisfying lives. But seeing the benefits that result from investing in family planning relative to the cost of providing services, I began to see it as something that has large financial returns—in addition to being the right thing for improving the lives of women, children, families, and nations. More than a decade ago, when the Millennium Development Goals had gained traction, an analysis of 16 sub-Saharan African countries by Scott Moreland and Sandra Talbird found that for each dollar invested in family planning, the health and education sectors saved at least two dollars—and in many countries, it saved much more. In Senegal, for example, one dollar invested in family planning yielded a savings of more than six dollars in future investments in education, immunizations, water and sanitation, maternal health, and malaria. Additional analysis found that in Bolivia, a dollar invested in family planning yields nine dollars to the social sector, and in Indonesia, the savings are $8.30 for each dollar invested. By investing in family planning and reducing unwanted pregnancies, demand for social services and programs decrease, reducing cost across all sectors. The 2009 release of the Guttmacher Institute’s Adding It Up provides additional evidence about the economic reasons to invest in family planning. If global investment in family planning increased from $3.1 billion to $6.7 billion, it would more than offset the cost of providing a recommended package of maternal and neonatal health care. The cost of providing the recommended maternal and newborn care package would decline by $5.1 billion—from $23.0 billion to $17.9 billion—because the number of unintended pregnancies would greatly decrease with better access to family planning. And the cost of providing both services in an integrated way would reduce costs from $26.1 billion to $24.6 billion—a net saving of $1.5 billion, compared with investing in maternal and newborn care alone. I came across a different type of evidence from policy models that indicate how family planning can make a substantial contribution to economic growth. Using results from the DemDiv model, which helps a country think about how it might achieve a demographic dividend, the effect of family planning on per capita gross domestic product is impressive. In Kenya, for example, 2050 per capita GDP is estimated to increase from $8,748 to $11,288 when family planning is included as part of the model. In Uganda, the model shows an even more impressive growth in GDP per capita in 2040 when family planning is included: growing from $6,084 to $9,567. Sometimes the good thing to do is also the right thing to do. And that line of thought became even clearer to me as I came across the Copenhagen Consensus Center’s Population and Demography Assessment Paper—an analysis that focused on the post-2015 development agenda. 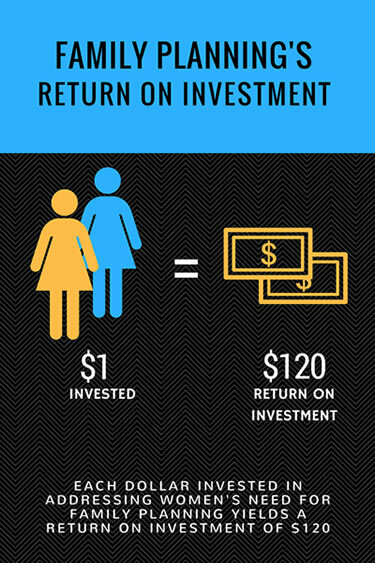 This rigorous analysis carried out by University of Pennsylvania professors Hans-Peter Kohler and Jere Behrman found that on a global basis each dollar invested in addressing women’s need for family planning yields an average benefit of $120 (with an estimated range of $90 to $150)—that’s a massive return on investment! The investment need is large—$3.6 billion, but in the grand scheme of things, that’s not a huge number. And the savings accrue from the need to spend less on social sector programs, largely health and education. Additional benefits result from lower rates of maternal and infant mortality, which can be averted through reducing unplanned pregnancies; the return on this area alone is estimated to be between $30 and $50 for each dollar invested. Benefits are also obtained from higher levels of education among girls and women, improvements to women’s general health, greater labor force participation by women, and an increase in the investments in children to have more productive lives. Lastly, benefits result from changes in population dynamics related to population growth rates and a larger working force population contributing to economic growth, relative to children and retirees. Family planning isn’t just a good investment—it’s a great investment and yields large positive returns. But perhaps more important is the transformative role that family planning can play at the individual, family, community, and national levels. Diving more deeply into how family planning contributes to health and social transformations is what differentiates it from other types of interventions. Certainly, family planning provides improvement to health, but there are also benefits related to empowerment, economic growth, and national security—among many others. And while women who use family planning are certainly beneficiaries, it is critical to look at the situation from a broader perspective—for example, we all benefit from having more stable populations around the world so that countries experience less civil unrest and depletion of natural resources and have a stronger economy with a better equipped work force. It’s a complex world, and I think we need to turn attention to the win-win opportunities that make countries stronger and that make us stronger, too. Given the evidence of its economic benefits it’s clear that investing in family planning makes dollars…and a lot of sense.